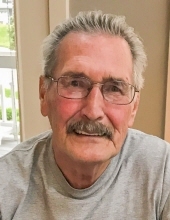 SPRING, Daniel Ralph - Age 76, of Fenton, died Sunday, February 3, 2019. Services will be held 12:00 PM Saturday, February 9, 2019 at Sharp Funeral Homes, Fenton Chapel, 1000 Silver Lake Road, Fenton. Rev. John Walworth officiating. Visitation will be held at the funeral home 11 AM Saturday until the time of the service. Those desiring may make contributions to The American Cancer Society. Dan was born May 21, 1942 in Durand, the son of Ralph Haynes and Marie Hazel (Tullar) Spring. He was a 1960 graduate of Durand High School. He married Janette A. Nordman September 25, 1981 in Argentine. He had resided in Fenton since 1981 coming from Vernon. Dan retired from GM V-8 Engine Plant and was a member of U.A.W. Local 659. He also was a member of the Fenton Fraternal Order of Eagles Aerie 2460, Durand Moose Lodge #2508, and the Linden Sportsmen Club. Surviving are: his wife, Janette; children, Collette (Scott) Gormley of Fenton, Danielle (Aaron) Potts of Parma, Dennis Hyde of Flint, Angela Luchenbill of Swartz Creek; daughters-in-law, Judy Kline of Copemish and Carrie (Sean) Beaudry of Clinton Township; 9 grandchildren and 10 great grandchildren; sisters, Charlene (William) Pierce of Los Cruces, NM and Peggy (Hans) Noetzel of Vernon; brother, Dennis (Bonnie) Spring of Durand; and several nieces and nephews. He was preceded in death by his parents; son, Joseph Spring; and sister, Beverly Spring. Tributes may be posted at www.sharpfuneralhomes.com. To send flowers or a remembrance gift to the family of Daniel Ralph Spring, please visit our Tribute Store. "Email Address" would like to share the life celebration of Daniel Ralph Spring. Click on the "link" to go to share a favorite memory or leave a condolence message for the family.